Sleek hair, without the fuss or frizz. Want modern, sleek hair, without all the fuss and frizz? Uh, who doesn’t? Consider this your go-to guide for straightening hair—no matter what your hair texture is, this will be helpful. 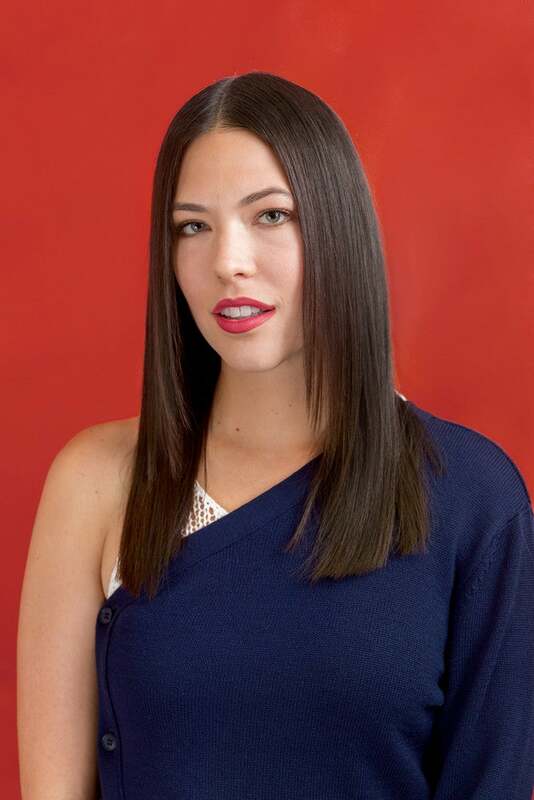 For this look on Rachel, Domino’s market editor, the master hairstylist and founder of Spoke & Weal, Jon Reyman, wanted to embraced the softness of her hair for a sleek look that’s finished without being too done. Reyman notes that soft hair “is slippery” and “it doesn’t hold bend well.” It’s hard to add volume to soft hair, but that’s often what people with fine hair want the most. “The hair may become greasy quickly, in many cases it’s more flat and limp,” adds Reyman. However, that doesn’t mean that those with fine hair should stay away from the flat iron—straightening your hair can give you a chic, shiny look. Soft hair can be curly or straight. Rachel has soft, slightly wavy hair, as you can see in her before photo here. Shampoo and lightly condition the ends of hair. Products that reduce frizz are perfect for this look. Reyman recommends Aveda Smooth Infusion for a sleek and smooth look. “You don’t want to get the hair too greasy, but it’s okay if some of the oils make the hair smaller,” says Reyman. Hair dry with the concentrator nozzle attachment, using a Mason Pearson or mixed boar bristle brush. The style of brush “really compresses the hair shaft down and makes it smoother,” says Reyman. Use a firm hair spray to add tack and humidity defense. Reyman likes Aveda Control Force Hair Spray. And Domino loves ghd’s flat irons, they work flawlessly. Use a thickening tonic to wet hair to add tack to the hair, something like Aveda Thickening Tonic or Living Proof Full Thickening Cream. Then add frizz protection to prep hair and shrink the hair down; Reyman prefers Aveda Smooth Infusion. Hair by Jon Reyman using Aveda. Makeup by Chantecaille’s National Artistry Ambassador Eddie Hernandez using Chantecaille. Produced by Lahaina Alcantara. Styled by Rachel Besser. Special thanks to Spoke & Weal for being awesome.